And the nicest thing about it snowing is that I didn't have to go anywhere in it (except to my mailbox). I enjoy snow the most when I can view it from inside-out. I have a new-old release this week, Rawhide and Roses. It's new-old because this is a re-release of one of my older Kensington Precious Gems books, originally titled, The Wild West. This was my first published book and of course, near and dear to my heart. I've spent some time renovating and updating the manuscript--and ended up lengthening it a bit. It's western. It has cowboys. A hero to die for. And a spunky heroine who has no clue what she's in for--in more ways than one. If you decide to take a peek at this one, I hope you enjoy. It's one of my faves. 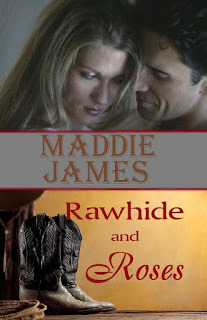 Rawhide and Roses is available in digital formats at Amazon Kindle and Barnes & Noble Nook, as well as other romance book venders, such as CoffeeTime Romance and More, and All Romance eBooks. At the present time, it's not yet in print, and I'm not sure it will be. But if you are real good between now and Christmas, maybe your significant other will gift you with a Kindle or Nook reader. Hint, hint! Other news? The grands are coming this afternoon for a visit, and likely they will take over every laptop and desktop in the house! I can't believe how computer savvy those little ones are. Thanksgiving went off without a hitch, and I'm making plans for 2011 in so many ways. Nothing like New Year's Day to motivate, eh? I have a number of books coming out next year so I'll be sure to update you on those in the very near future. Hope you are having a wonderful weekend. Take care, and if you have snow, enjoy it! BTW, love the new look of the blog, Maddie! Thanks, Renee! On all counts. I've redone the website and tried to make the blog "similar but different" from the web. I'm usually not a lavendar/purple girl but this appeals to me! I'm hoping that Rawhide will be out in print in the next couple of months, just didn't get done. I hope you get your new Kindle, too! I love mine. Oh, and when you read the book? I'm interested in hearing how you think I handled the pack trip scenes, etc... I did a ton of research on this one! And, the opening experience in the book? Happened to me. Ha!